Update the Gracenote® Album Info (Gracenote® Media Database) that is included with the navigation*/audio system. 1. Insert the update disc into the disc slot or connect the USB flash drive that includes the update. 2. Press the SETTINGS button in the HDD mode. 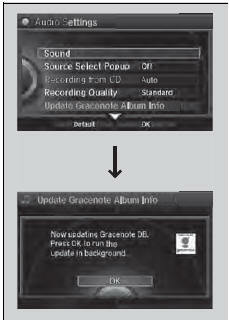 - Repeat the procedure to select Update Gracenote Album Info. 4. Rotate to select Update by CD or Update by USB, then press . - The system starts updating and the confirmation message appears on the screen. Press to finish. To acquire updated files: • Consult a dealer. Once you perform an update, any information you edited before will be overwritten or erased.